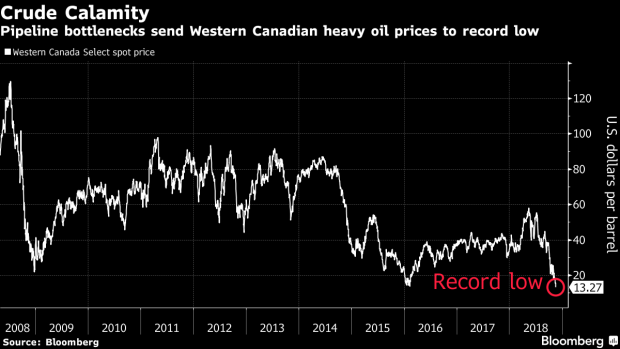 Heavy Western Canadian Select crude fell to a record low on Thursday before rebounding Friday as several oil producers shut in production and some demand the Alberta government intervene to mandate across-the-board cuts. The oil-sands benchmark hit US$13.46 a barrel Thursday, the lowest in Bloomberg data extending back to 2008. The price broke a previous record set in early 2016, when West Texas Intermediate crude futures were trading under US$30 a barrel amid a world-wide supply glut. Canadian crude closed Friday up US$3.97 at US$17.43. The price collapse comes as pipeline bottlenecks in Western Canada constrain exports just as WTI experienced a record losing streak amid rising U.S. stockpiles and projections for reduced demand. U.S. crude, meanwhile, notched its sixth straight weekly loss, weighed down by concerns over whether OPEC and its allies can reduce production enough to stanch a global supply glut. After bouncing between gains and losses on Friday, futures were unchanged at the close of New York trading, encapsulating the uncertainty in the market after a tumultuous week. U.S. oil prices plunged 7.1 per cent on Tuesday, the most in three years, before recovering some ground later in the week. Brent for January settlement added 14 cents to US$66.76 on the London-based ICE Futures Europe exchange. The global benchmark crude traded at a US$10.08 premium to WTI for the same month. West Texas Intermediate for December was unchanged at US$56.46 a barrel as trading closed on the New York Mercantile Exchange. Total volume traded was about 7.1 per cent above the 100-day average. Producers including Canadian Natural Resources Ltd. (CNQ.TO) and Cenovus Energy Inc. (CVE.TO) have responded to the price drop by curtailing what could amount to as much as 140,000 barrels a day or more, according to company statements. Some operators have gone further, asking that Alberta’s government mandate production cuts across the province. Western Canadian Select at Hardisty, Alberta, traded at US$43-a-barrel discount to WTI Thursday, US$2.50 wider than on Wednesday, data compiled by Bloomberg show.